On the massive Greenland ice sheet, a partially-melted band circles the ice edge. In this transition zone between ice and rock lie important clues to understanding how water melting on the ice sheet surface will impact the ice sheet’s overall rate of melting. Using instruments on the surface, in the ice, and at the interface between the ice and underlying rock, Joel Harper (University of Montana, Missoula) and Neil Humphrey (University of Wyoming) hope to better understand the mechanical and thermal properties of the ice sheet by quantifying where water moves through the ice and how much water flows through those channels. 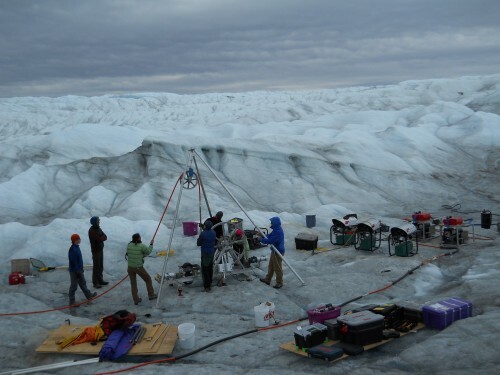 “Understanding connections between the surface and the bed, will help us better understand how meltwater contributes to ice sheet melt, particularly at glacier margins,” says Harper. With more field observations, Harper’s team aims to connect the dots between surface melt and a speedier rate of ice sheet melting. Their work has taken on new urgency following satellite observations that show the area and annual melting time for this slushy ring steadily increasing. The velocity of some GIS outlet glaciers is also increasing. Harper suspects that surface meltwater drains to the ice sheet base where it acts as a lubricant, facilitating faster sliding. Numerical models that explore how water moves through the ice sheet were developed primarily from observations of mountain glaciers. Scientists like Harper and Humphrey are finding that these models don’t really work toward the interior of the ice sheet where the ice is deep so they are focused on using their observations to improve several different ice sheet flow models. 2012 research builds on the group’s 2009 study, which examined how surface melt moves through the snow. That two-year study involved meteorological data collection, ice coring, and detailed radar surveys at 14 evenly-spaced sites along a 75 kilometer transect beginning near Crawford Point and following the EGIG traverse completed by the same group in 1991. They also injected a biodegradable red dye called Rhodamine WT into the snow. 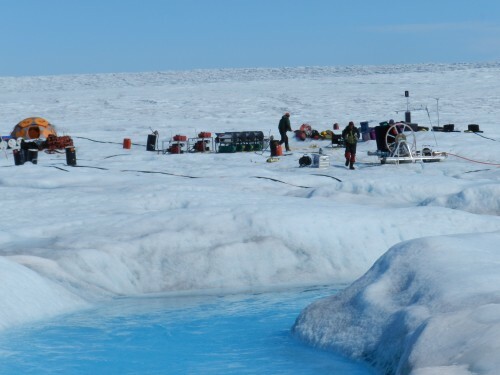 Using a fluorometer, an instrument mounted to the end of a long probe inserted into the snow, Harper’s team traced the path of the dye as it moved through the ice sheet. In 2010, the team focused on testing a new hot water drill, built by Humphrey, which provided greater efficiency in drill time, weight and personnel required for operation. Harper and Humphrey spent five weeks in the field during May and June, 2012 with six students. The team staged gear near point 660 outside Kangerlussuaq. Helicopters shuttled the team to the main drill site at Issunguata Sermina Glacier south of Russell Glacier. When drilling boreholes, the team starts with water – either from surface streams or made by melting snow. So far, the team has drilled 23 boreholes to the bed and a few more that they intentionally stopped before the bed. Cold temperatures are always a challenge. 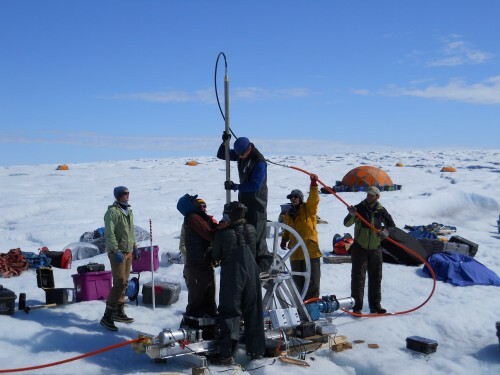 In each borehole they take detailed temperature measurements to understand the ice sheet’s thermal structure. Holes are fitted with longer term temperature monitors. Pressure transducers lowered to the borehole bottom record water flow at the ice sheet’s base. Data are recorded to a data logger and downloaded at the end of each summer field season and again in late fall when Harper and Humphrey return to winterize field instrumentation. “When the borehole is a kilometer long, lowering and raising the sample can take a while, and that’s nerve wracking because the hole is freezing closed and we don’t have much time. So we have learned how to handle the cable when we are pulling up the sampler with a motor driving it at super high speeds. The team also used a towed radio-echo sounding device to extract two-dimensional images of the ice sheet interior. The team’s next drilling project, targeted for 2014/15, will focus on ice deformation. Data will be used to improve ice sheet flow modeling. Harper, who prefers Greenland’s drier climate to that of his usual Alaskan field sites, hopes his team’s work will help answer fundamental questions about how glaciers work.